Alex Toth was a genius comic book artist. He famously passed away of a heart attack at his drawing board at the age of 77 in 2006, but his legacy had been cemented for decades. He’s primarily known today for his work in animation, where he designed classic Hanna Barbera cartoons like Space Ghost, The Herculoids and Super Friends. His comic book work is far more impressive, but it’s sadly overshadowed by his more famous animation work. 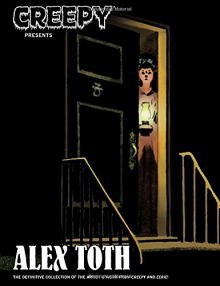 There are several books on the market that present detailed looks at his life and career, but Creepy Presents Alex Toth lets his work do the talking, and his work stands on his own as some of the most innovative graphic storytelling in the history of the medium. Creepy Presents Alex Toth collects all of the stories Toth drew for Creepy and Eerie Magazine during three stints working for Warren Publishing. His first work for the company was done under the editorship of Archie Goodwin, who still ranks high on most people’s list of the greatest writer/editor in comics. By this point in his career Toth had hit his stride and distilled his artwork to a deceptively simple-looking style that combined the austerity of animation design with the grand tradition of adventure comic strip art and highly innovative layouts that recal and surpass the experimental work of comics pioneer Will Eisner. Eight of the twenty-one stories in this collection are written by Goodwin and feature Toth at his peak form. The short-story “mystery/horror” form is perfectly suited for Toth’s moody style and his work here is worth the price of the book by itself. His mid-1970s work in this book is no less amazing. Working with a variety of Warren’s writers like Bill Dubay and Rich Margopoulos and Steve Skeates, Toth turned in incredible work, and also provided four stories that he scripted himself that are among the best work of his career. 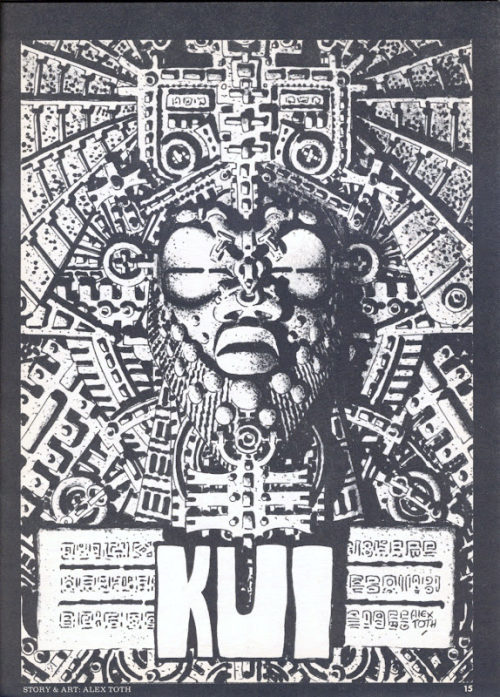 In particular the story, “Kui,” which features a splash page that reportedly took several days to draw. Most of Toth’s work during his final stint with Warren saw Toth inking over other artist’s pencils. The results are novel and fascinating. 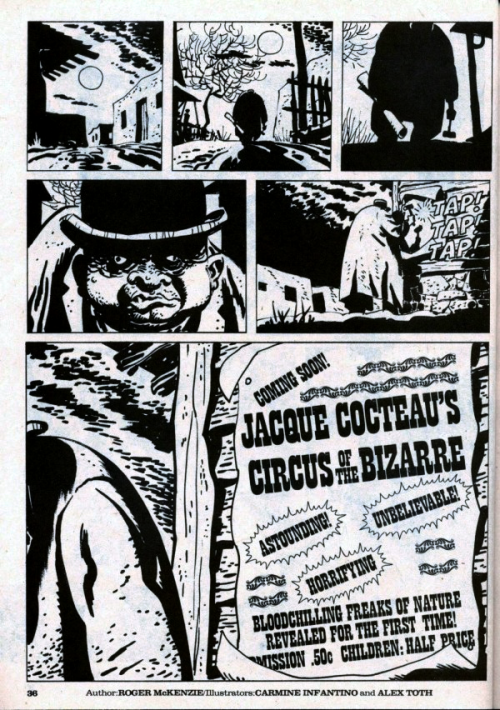 In particular, the story “Jacque Cocteau’s Circus of the Bizarre,” written by Roger McKenzie and pencilled by legendary DC Comics artist, Carmine Infantino, looks nothing like the work of either artist. If anything, it looks like the more experimental work of Love and Rocket’s artist, Gilbert Hernandez. Creepy Presents Alex Toth belongs in the library of every person who considers themself an educated fan of comic book art. His layout, rendering and lettering are among the best that comics have ever seen. In this day of cookie-cutter house-styles and heavy Manga influences, any student of the form should be studying Toth to see what comic books can be.